Hydroponics not only holds great promise for the future of modern agriculture, it can also be a fun and rewarding hobby. Building your own hydroponics system can give the builder a better feel for how how it all works and the sense of accomplishment of making something on their own. 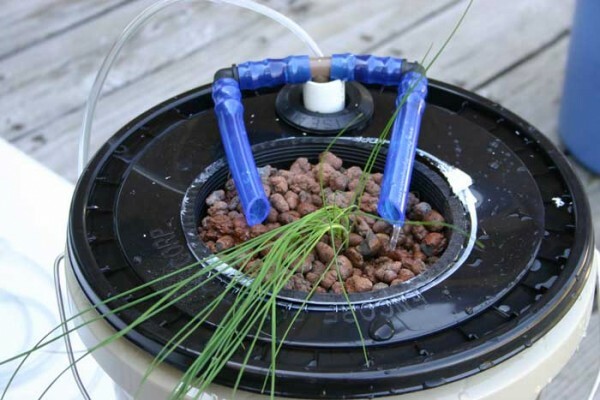 There are many good quality hydroponics units for sale but for someone looking for something simple, effective, and easy on the wallet, a DIY home hydroponics system may be the best choice to get started in soilless gardening. When considering making a DIY home hydroponics system one should consider the location, the lighting, as well as other factors such as temperature. Indoor hydroponics systems where the lighting, air flow, and temperature can be properly maintained will perform quite well. Hydroponics done outdoors comes with more potential for problems such as pests and temperatures getting too high. A good system then would be one that could be used indoors or outdoors in the right conditions and be easy to operate and maintain. Deep Water Culture systems are a great first garden to build for anyone looking to try a DIY home hydroponics system. DWC systems are basically a fairly deep reservoir where the plants roots will grow into. 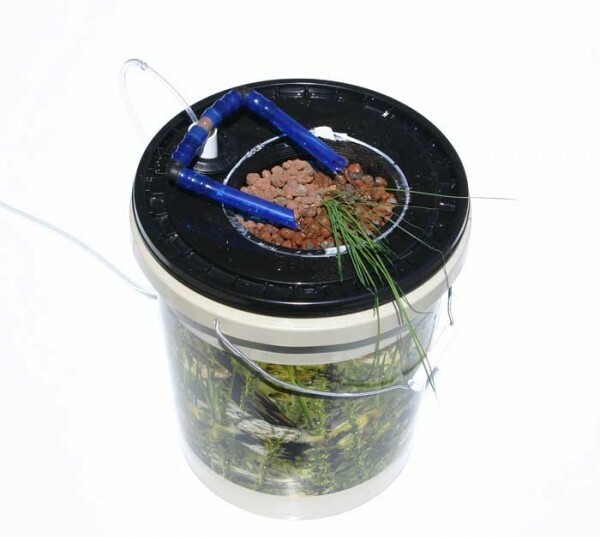 Many DWC systems are simply a bucket with a net pot. Most DWC designs utilize an air stone inside the reservoir to oxygenate the nutrient solution. Some people call it “bubbleponics”, when the water is pumped up over the roots in these types of systems. Below is a simple project that aims for the most efficient method of these approaches. In an efficient system we would want to oxygenate the nutrient solution as well as improve its delivery to the root zone for faster, earlier growth. Ideally we would want to use only one pump and in this case we will use an air-pump only. This means that the air-pump will oxygenate the water at the same time that it is pumping the water up and over the plant roots. In creating this DIY hydroponics project we utilized some basic parts and most people can make one of these for approximately $30 to $45 depending on what they may already have. 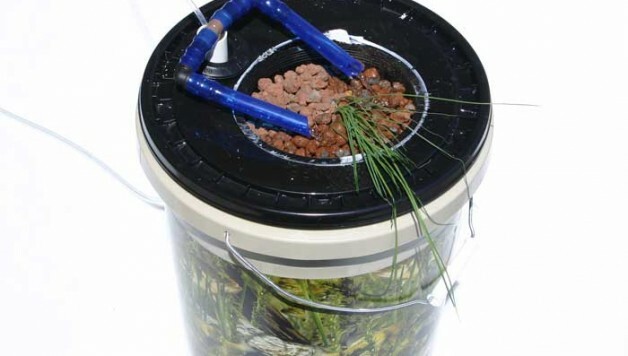 It’s basically a standard bucket, bucket lid, net pot, General Hydroponics WaterFarm kit, and an air-pump. More detailed information on this build can be found over at TheHappyCultivator where there is also a link to a video of the build. 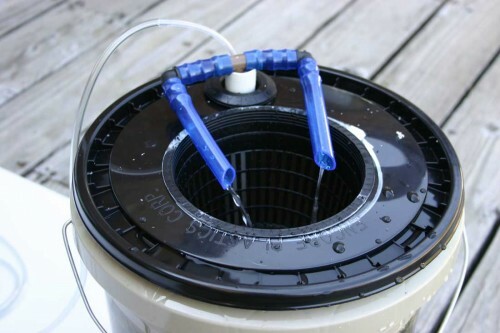 These types of bucket systems are fun to make, and they’re simple and easy to use. They’re particularly well suited for some of the larger bushier plants like tomatoes, peppers, or large herbs. So if you’re considering giving a small hydroponics project a try this is a good design to consider for beginners.